Often times, pets looking for a companion stick to the same few breeds- Altachucks, Cobralls, even Piles of Soot. But in our developing world, taking care of these pets can often times be a challenge. Balancing work, school, and everyday life is a challenge on its own. Taking care of a Petpet can be yet another drain on our time. However, there are plenty of Petpets that don’t need as intense care as others. Yes, Petpets that exist merely to provide you with companionship, no need to worry about anything more than a battery charge. Available in 4 colors- Standard/purple, faerie, yellow, and green- the Cybit is your cheapest option for a robot Petpet. A simple critter, Cybits are said to make cute chirping sounds, and love to spin around. Providing simple entertainment for your pet, a Cybit is a simple and cheap pet. Don’t let its low price tag fool you- Cybits are valuable companions. The N4IRB is a staple of space life. The bots can be found skittering around the space station, collecting information to deliver to an unknown source. These bots are a perfect choice for any Neopet in school. Thanks to the N4IRB’s talent in data collection, they make the perfect study companion. Available in 5 colors- Standard/blue, pink, green, yellow, and red, they can be made to fit any Neopet’s taste. If you’re willing to spend a few more neopoints, check out the Vacumatic 9000. They’re the perfect option for any pet who needs a little help cleaning their house. Have a teenage pet with a messy room? Let the Vacumatic 9000 work its magic and it’ll be clean in no time! Need a little extra help cleaning the house? The Vamunatic 9000 is an ideal helper. Even if you aren’t looking for a household helper, the Vacumatic 9000 is still a perfect option- it’s the only Petpet that isn’t afraid of a vacuum! The Diddler is one of the most perfect Petpets you could decide to purchase. Not only is it one of the cheaper options on the market, but it has a perfect design. With multiple built-in games and a friendly face, the Diddler will keep your pet entertained for hours on end. In addition, this perfect pet is available in two colors- Standard/blue, and faerie. The Diddler will never fail to keep you entertained, and is well worth the price. If you have a water-bound pet who wants a more modern option, the Chomper is your best choice. With a sleek blue design, this water-proof robot is one of the few options you’ll have for a Petpet you can take for an underwater stroll. Even better, if you’re looking for a water-bound guard dog, the Comper has you covered. Just be careful, though- If you mess with one when it’s angry, you’re in for a nasty surprise. A mischievous Petpet, the Griefer is the perfect choice for a Neopet who loves a good prank. Available in 3 colors- Standard/white, maraquan, and plushie, the Griefer is a very versatile Petpet. With no arms, you don’t have to worry about any of your possessions going missing- just be aware that your floors might get a little scratched up. If you’re looking for something a bit more organic, a Fleurbik is the way to go. They’re known for hiding amongst bushes to trick passerby, meaning that this Petpet is also a good choice for any Neopet ready to pounce. The Fleurbik may look a little scary, but don’t worry. Any Petpet is bound to warm up to its owner if it’s shown the love and attention it deserves. For a less metallic robot Petpet, the glowing Blobagus is your way to go. We aren’t really sure exactly what they’re made of, but we know they’re at least affectionate. On the lower half of the price range, they also make good pets for owners on a budget. Without any feet or paws, you don’t have to worry about scratches on your furniture. Even better, they’re available in a whopping 9 colors! Standard/green, blue, grey, plushie, maraquan, water, fire, Christmas- and if you’re looking for a truly robotic experience, they’re also available in the robot color. The Blobagus never fails to impress with its versatility. Similar to its less-destructive Blobagus cousins, the Globilol is unlike them in many ways. Not only are they significantly more expensive, but they’re also a lot more advanced. Though Globilols can start off small and sweet, they can quickly become destructive and mean if they aren’t treated with love and affection. Though they aren’t available in any other colors, the Globilol is a perfect choice for any owner looking for a Petpet that needs a bit more attention. Another one of the cheaper robot Petpets, the Navibot is a handy companion to have around. Thanks to a built-in navigation system, with a Navibot by your side, you’ll never get lost! Not only are the budget buddies perfect for a pet who gets lost, but they’re also available in many colors- Standard/red, blue, yellow, pink, faerie, fire, dung, Christmas, and Halloween. Such a versatile and useful Petpet is the perfect choice for anyone looking for a robot buddy. Beginner or expert, a Navibot is an essential addition to any family. By far the most expensive choice on this list, the Zoomik is a Petpet that should only be taken on by experts willing to commit to the care of a robot. Released way back in Y5, the Zoomik is a r99 Petpet, meaning your best place to find one is on trades or auctions. Though they aren’t available in any other colors, owning one is impressive on its own. If you’re willing to spend the money, a Zoomik is an impressive and beautiful addition to any collection. Despite my ratings, any Petpet- robot or not- is a great addition to any family. Hundreds go without homes any day. 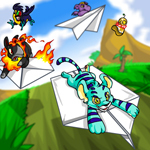 Take some time to consider getting your Neopet a Petpet. Not only are you helping a Petpet in need, but you’re giving your Neopet a lifetime companion.